Category: Hikarimono (silver, shiny fish). Season: late fall to late spring. Japanese Spanish mackerel (sawara) is another "promoting" fish; it is called different names in Japanese depending on its stage of life. When young, it is called sagoshi. I'm not sure what the kanji for sagoshi is, if anyone knows what it is please let me know in the comments below. 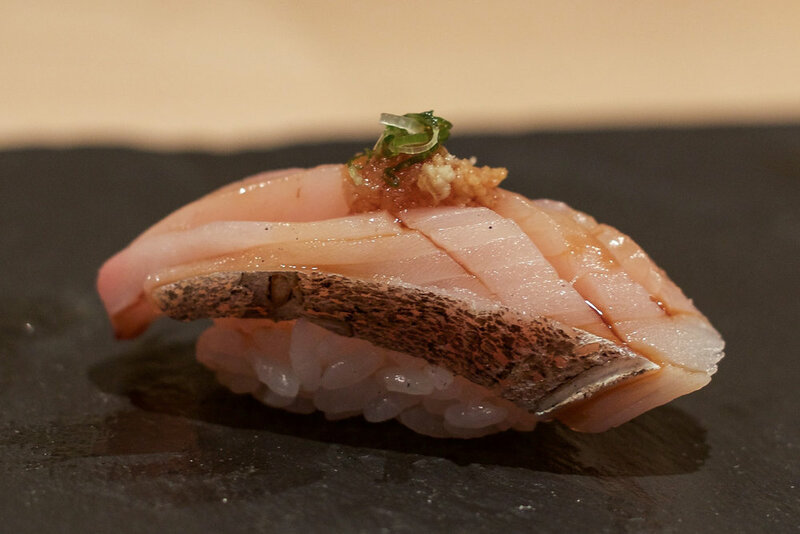 Sagoshi has a delicate, tender flesh and mild flavor, especially for hikarimono. It is usually served with a small sliver of its skin still on, and topped with nikiri, minced ginger and chopped scallions, as pictured above.